The Book of Myself, by Carl and David Marshall is a great fill-in-the-blank style with excellent prompts to get you thinking about your life story. Grab your favorite pen and answer the questions, easy to do. Living Legacies, by Duane Elgin and Coleen LeDrew is a wonderfully practical illustrated how-to guide full of great questions and examples. If you’re more visual and like to “see ” how it’s done, take a look at this one. The Complete Idiot’s Guide to Writing a Memoir, by Victoria Costello is everything you’ve come to expect from this series. Don’t take offense, it’s really an easy to follow guide that covers the nuts and bolts in a practical, doable way. If you enjoy writing this is probably the book for you. 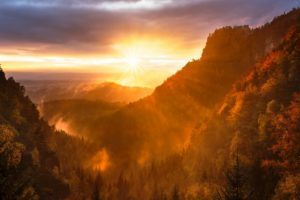 Be inspired, not overwhelmed–you’ve got this! One of the most satisfying things you’ll ever do is help someone tell their story. Did you know you don’t have to be “older” (whatever that is) to share a slice of ordinary daily life in a remarkable way? My young friend Jenny Shuster brought readers into a typical evening in her life in less than 200 stunningly beautiful words. Please read and let her show you how it’s done! “My life is nowhere near the “American dream”. But it is beautiful in its own way. This evening, as I helped Carissa take a bath, I could hear Sophia practicing a beautiful Mozart aria in her room. The rhythmic clink of weights coming from John’s room added erratic punctuation to her singing. Our lodger Lydia was in the living room deep in homework for her graduate class. Dad was working his usual culinary magic in the kitchen preparing a hearty dinner for the hungry horde. And Mom was out with the last of the sunlight preparing the garden for spring. Not long after dinner (we usually eat late) Bill would be home from work, and we all would enjoy a few hours of each other’s company. I’d love to read your slice of life too, please send it in. Today many of us are Irish wannabes. Your version of mixing the cultures might mean something like a green burrito. Or it may go much deeper. Do you have family roots that grew out of the Emerald Isle? You’d be surprised at how far the web of cultural intermingling extends. There are many historical links between Mexico and Ireland, often leading to marriages and families founded as a friendly cross cultural partnership here in the southwest. As comedian Brian Regan likes to tease, “and one thing led to another….” I’ve met several families here in southern New Mexico proud of their shared heritage. So, on this St. Patrick’s Day 2018, as you honor the remarkable, real Patrick, born in 385 A.D. (original name Maewyn Succat), may you be inspired to toast your Irish and Mexican ancestors alike. Let me know what Bit o’ the Irish you found in your heritage. Today I stopped by Buddy Day at a nearby park, sponsored by Down Syndrome Families of Las Cruces. I saw super heroes, without capes, doing many amazing and wonderful things. The early spring grounds were packed with kids and their families having a blast in the jumping balloons, eating hot dogs and nachos and cuddling the animals in the petting zoo. Horses pulled trolleys loaded with grinning kids around the park. Local first responders provided thrills, patient explanations and boosts to look inside their fire trucks and ambulances. Spiderman and Mickey Mouse were also making the rounds, kneeling down to hug children, high fiving them and it started me thinking. Here’s a great little game to play with your kids that will encourage them to think about what makes them unique. It also gives you a chance to help them see their extended family and others through a different lens. Collect some basic art supplies, paper, crayons, pencils, etc. maybe even some modeling clay. 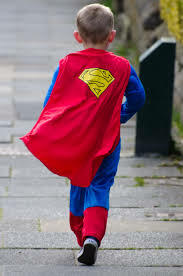 Wearing a Superman Cape can Help Preschoolers! 2–Have the kids draw, paint, make a sculpture or otherwise use some of those art materials to create a visual model of themselves as a superhero or otherwise showing their superhero awesomeness. 3–Talk about parents, grandparents, aunts, uncles, teachers—someone older than them. Ask your kids “What’s Grandma’s superpower?” “How do you think Uncle Jim is a superhero?” Write the description, draw the picture. Maybe you’ve got Grandma in a red cape, wielding a rolling pin and making the best pie ever, maybe Uncle Jim’s superpower is being a fireman and helping people, or fixing cars. Maybe Aunt Tina’s cape has dog bones on it and she’s the best puppy trainer you’ve ever seen. 4–Share the superhero goodness with the people you’ve honored. Ask some more questions about their super power and how they use it to help people. You might even take your collection of family super hero pictures and descriptions and put them together into a simple photocopied book. Make extras and share them with each other. Love, laughter, appreciation and joy magnified! As promised, let’s talk about how to use the objects in your life to weave the threads of a story. The Sewing Machine, by Natalie Fergie is currently on Amazon’s best seller list. This fascinating novel uses a common household tool as the common element tying together lives and families across generations. I’ve decided not to give you too many details as I don’t want to spoil a good read. If you think you’ve seen this plot before let me challenge you—you have never seen it quite like this! You will never look at the mundane objects in your life the same way after reading this book. It will open your eyes to nuances of story and coincidences that have affected your own life. It will make you think. Any maybe dismiss the whole notion of coincidence. Trace the history of an object through your family tree. You can use the history of an object to both anchor and tell your own family history. This popular technique is used by fiction writers and works beautifully in writing your memoir too. Is there something that has been passed down through the generations? Trace its origins, who held it for a time and why. Who has it now? Why? Where do you think it will go next? Can you imagine a few generations down the road who might cherish it? Why? There is value in castoffs– people and things—why is this particular object valued? can you trace the attitudes of your object’s previous owners? One of my clients has a rolling pin that is very special to her. She is a great natural story teller and loves to pass on the history of this object. And her grown children and their children love to hear it. Grandma’s rolling pin has a legacy all its own. It started as a wedding gift many generations ago, prior to the Civil War. It was lovingly passed down and is part of a tradition of pie making and biscuit rolling that touches the heartstrings of all in the family. It connects them. It isn’t just a chunk of hardwood; it is the memoirs of family gatherings, of joyful times celebrated, of grief shared. It is the connecting piece, witnessing future hopes as little hands are coached in how to roll out the pastry evenly and as new grandchildren are bounced on knees over a piece of after-dinner pie. It sits in testimony to the love and resilience of family as friendly bantering bounces around the kitchen about which kinds of pies to bake this year. Make a list of the important objects in your life. You will probably see one or two rise to the top with a feeling of emotion and poignancy that shouts out “Tell my story!” Now, get that thing and hold it, look at it, really see it in all the details. Let your mind wander over everything you know about it and the people who have cherished it before you. See how many points of connection you can make with that object(s). ! When you’re done with this little exercise you will probably have enough material for several chapters or your own little mini-memoir using this object as the thread.